Helmet mod. 40 SS "Quist". One-decal helmet of the Waffen-SS pattern 1940. 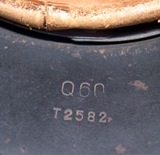 The shell is marked inside on the back Q60 and T2582. The first means that the helmet was manufactured from the factory Quist and that the size is 60. The second concern the production lot realized in 1943. The liner is marked 53 that is the right size of the helmet. The factory Quist was situated in Esslingen, near Stuttgart. Second pattern decal. In real good condition. Notify me of updates to Helmet mod. 40 SS "Quist".